Last year’s U.S. eCommerce holiday spending season fell slightly short of initial forecasts, but continued to grow 14 percent over 2011. comScore presented its “State of the U.S. Online Retail Economy, Q3 2013” (SOR13) webinar, which offered some exciting 2013 holiday spending forecasts for retailers as well as insights into opportunities for digital marketing strategy this year and beyond. This year’s holiday season is the shortest it has been since 2002, with approximately 6 fewer days of shopping than last year. However, concerns over unemployment and rising consumer prices have lessened, laying the groundwork for an exceptionally promising Q4 2013. When comparing Q3 2013 to Q3 2012, for example, total dollar sales are up 13 percent to $47.5 billion. Additionally, total dollars spent per buyer is up 13 percent and the number of transactions per buyer is also up by 10 percent. Although the total number of buyers has not changed, consumer purchasing power is showing signs of improvement. To capitalize on the emerging trends outlined by comScore, we have broken down the major takeaways as well as outlined the implications and key opportunities for digital marketers. Desktop eCommerce sales are up 12% year-over-year from 2012, setting a potential for $300 billion in overall sales for 2013. With desktop eCommerce outpacing total consumer retail spending, 2013 may be the final call for all marketers to respond by shifting their marketing budgets toward digital strategies. Although users are discovering brands on a multitude of channels, many marketers simply haven’t kept pace or made adjustments for the continuously growing eCommerce trend. comScore also indicated that shifts to eCommerce stem from new segments of people coming into the market who have graduated, embrace technology, are comfortable with online shopping and now have purchasing power. All digital marketing, from search engine optimization, social media marketing, paid advertising and mobile-optimized websites, will be key moving forward. For digital advertising, retailers should consider content that calls out their free shipping options. Across segments, retailers are noticing that consumers are driven by free shipping and free returns. This trend will continue to drive online sales. 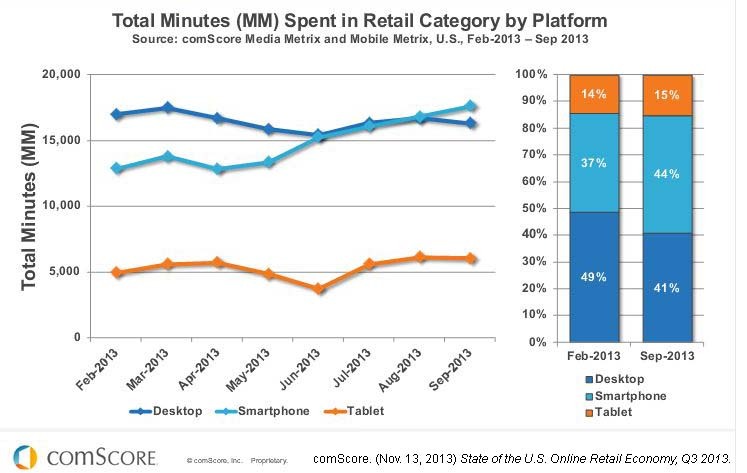 2013 may be the last opportunity to get a solid foothold on mobile commerce. Mobile buying now accounts for approximately 11 percent of all ecommerce. And it will only continue to grow. 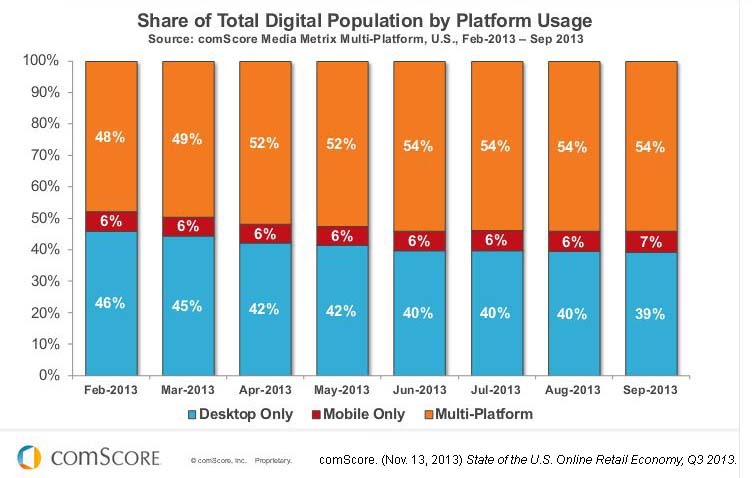 For the first time ever, the majority of internet users now browse on multiple platforms. As of September 2013, approximately 54 percent use both desktop and mobile (smartphone and/or tablet devices) to browse the web and shop online. Marketers must respond with integrated, cross-platform strategies to reach consumers. In fact, as of August 2013, more digital users engage with brands on their smartphone than on their desktop. The smartphone market saw a 24 percent increase year-over-year to reach 140 million users and tablets had an incredible 60% year-over-year growth to reach 70 million users. App versus website shopping is still a point of major debate, but depends primarily on the retailer. eBay and Amazon see most shopping and browsing from apps, whereas many other companies are still seeing users gravitate toward mobile browsers. It is, however, still critically important for all eCommerce sites to drive app usage and incentivize downloads. As mobile continues to take over the majority of browsing, it will be critically important to have a foothold in the channel shift. Those that do not risk losing market share. comScore anticipates that during the 2013 holiday season, mobile commerce will reach its highest percentage of total digital commerce at approximately 12 percent and approach nearly $10 billion in total spending. It’s time to take advantage of Pinterest and the power of social commerce. Pinterest is one of the fastest growing websites of all time; its content is image-based collections of primarily retail-centric commodities, making it an excellent social platform for marketers to drive eCommerce sales. 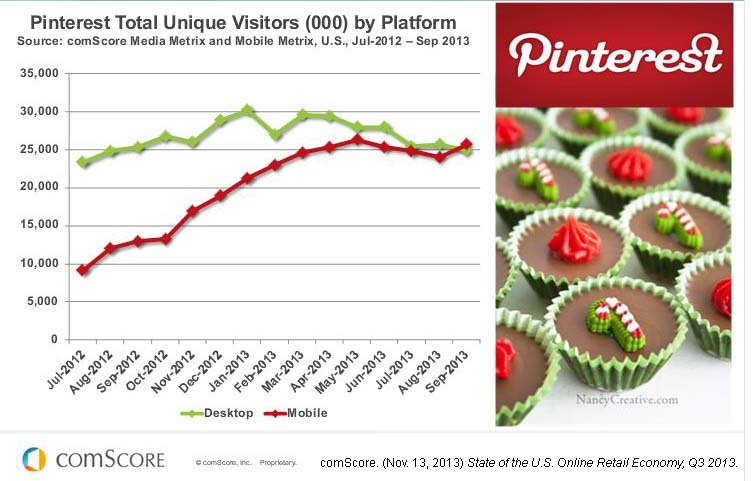 Beyond its huge opportunity for marketers overall, Pinterest now has more mobile users than desktop users, yet another consideration for digital marketers moving forward. Beyond Pinterest, Facebook will continue to help drive online sales. Beyond likes and fan acquisition it will be important for marketers to follow the steps to optimize their social presence and drive Facebook engagement into sales. Brands must reach users in their news feeds with excellent content that their fans then engage with and share to their networks. Quality content when combined with strategic ad placement can help boost conversions and directly influence sales growth. In order to keep up with emerging trends in eCommerce, mobile purchasing, and social media, marketers must make budget and resource allocation adjustments. As the state of the U.S. economy continues to improve, these changes will be critical for the 2013 holiday shopping season and beyond.